User selects the appropriate scenario using the touch screen and will place the papers to the feeder. Instantly N7100 will scan the papers, save them in its local HDD and search for OCR tags (keywords) inside the created pdf, in order to categorize each pdf that was scanned. The system is preconfigured with a default categories’ structure, for example: Invoices, Qualify forms, Manuals, Certificates, Health Records, etc. After searching for OCR Tags, files will be marked with that tags and send to Synology DS216j folders as per category. If OCR won’t be able to categorize the pdf, it will be saved to folder Various. 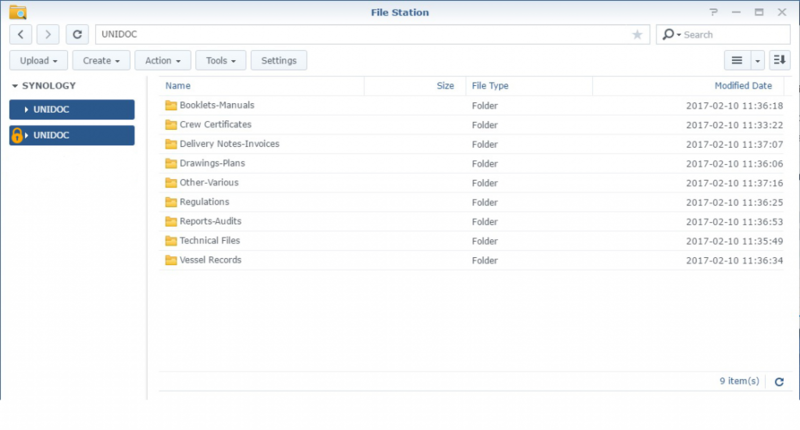 (Synology is configured to share specific folders only with N7100 using Local Network Shared Folders. User can select UNIDOC Encryption, DS216j will encrypt the pdf’s using AES 256-bit. Users will have the ability to access all the pdf’s either through a web interface via any device (Windows, IOS, OSX or Android device). All of the files are accessible locally and remotely as per user request by inserting the right credentials.